You plan the party and let us do the cooking. You can pick it up at our place or we will deliver it to you. You may also select hors d'oeuvres from our custom hors d'oeuvre menu. Each tray is beautifully garnished and contains condiments when applicable. Pricing does not include a delivery charge or sales tax. Fresh sliced ham, turkey, tender roast beef, salami, pepperoni and pastrami with an assortment of Swiss, American and Provolone cheese and breads. Petite rolls are available upon request. Chicken salad may be added for a forth selection or substituted for a meat selection. Add 20% for Chicken Salad. A variety of fresh and grilled vegetables marinated in sauces that are designed to enhance flavor and appeal. Broccoli with Vidalia Onion Sauce, Cauliflower and Grilled Asparagus with Balsamic Glaze, Grilled Squash and Zucchini, Carrots and Celery with Dipping Sauces. Seasonal Vegetables may be substituted. A beautiful display of Atlantic Smoked Salmon garnished with your choice of cream cheese, chopped boiled eggs, Red onions and capers or our special Vidalia Onion Sauce. This display comes with crostini and will feed approximately 50 - 60 people. A generous portion of seasoned Gulf Coast (21-31 count) peeled shrimp cooked with our special blend of seasonings and garnished with lemons and cocktail sauce. (16-20 count available for a slight up-charge) For Peel and Eat, See A La Carte Menu. Experience the best of both world's as our chef prepares a platter of Atlantic Salmon combined with Gulf Coast Shrimp per above. Tartar and Cocktail Sauce included. **These prices are subject to change due to seasonal prices** Call for current prices. Thinly sliced medallions of tender beef served with petite rolls and horseradish sauce. This is the perfect pick-up item for your next party. A colorful combination of mild and delicious Mozzarella cheese, salami, pepperoni, cheese stuffed kalamata olives, sun dried tomatoes and grilled roman style artichoke hearts. An old time favorite for any party; choose either Swedish, Italian with Marinara, Smoked BBQ and jelly, Sweet and Sour or Hawaiian. We will have your selection ready to heat and serve. These two very popular dips are a real crowd pleaser at all parties. Your selection is served with your choice of fresh baked crostini rounds or tri-colored tortilla chips. An entire rotisserie smoked brisket sliced in Au Jus and ready to serve. This selection comes with petite rolls and BBQ sauce and will serve approximately 50 guests. Our old-fashioned homemade chicken salad is hard to beat served on a bed of crisp lettuce and garnished with lettuce and a tomato and served with your choice of petite rolls, special sandwich breads or petite croissants. A variety of petite sandwiches to include any 4 selections of: chicken salad, beef, pimento cheese, ham, smoked turkey. 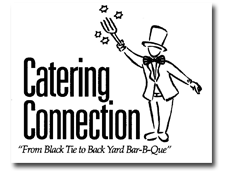 The Catering Connection can customize your menu to suit your taste and/or budget. Feel Free to 'Mix and Match' any menu items. Call us today so that we can create a menu specifically for you! Choice of Fresh Vegetable Tray with Dip or Spinach Dip with Chips. Smoked Chicken and Sausage Pastalya. Pasta Station with Fettuccini Alfredo, Marinara and Pesto Sauces. Prices are Quoted for Drop Off Only. Prices are Quoted for no less than 75 People. Served with Choice of Sides. The Whole Pit Roasted Alligator can be stuffed with boudin or a dressing of your choice. Each make an impressive presentation! Boiled in our own blend of season boil, iced and served with Corn, Bread, Potatoes, Garlic and Onions with Housemade Cocktail and Remoulade sauces. Boxed Lunches: Sandwiches, Wraps, Salads and Sides. Sliced Breast of Turkey, Shaved Ham or Tender Roast Beef on a 6" French Poboy with Swiss cheese, tomato, lettuce and condiments with two sides items listed below. Turkey and Ham on a 6" Poboy or Wraps with provolone cheese, tomato, lettuce and condiments, with two sides items listed below. Roast Beef or Turkey on a fresh croissant with tomato, lettuce and condiments, with two sides items listed below. Grilled Breast of Chicken on a Kaiser Roll with Swiss Cheese, tomato, lettuce and condiments with two sides items listed below. New Orleans Style Muffaletta with Olive Spread and Dijon Mustard, with two sides items listed below. Grilled Chicken Wrap with a seasoned mayonnaise spread, lettuce and tomato, with two sides items listed below. Deluxe Bar-B-Que box lunch includes a hearty pulled pork Bar-B-Que sandwich with two sides items listed below. Our Economy Corporate Lunch Menus were designed to meet the needs of our corporate clients who were requesting fresh and hot meals on a limited budget. These meals are served Buffet Style on disposable dinnerware and include a canned beverage or tea. For full buffet service add a 20 percent service charge to each menu. Sides are hushpuppies, potato salad and cole slaw. Served with: Condiments, Potato Salad or Chips, Cole Slaw or Baked Beans. Served with: Dressings and Condiments. Served with: Baked Beans, Cole Slaw or Potato Salad, Buns and BBQ Sauce. Served with: Homemade slaw, Mashed Potatoes and Gravy, Seasoned Green Beans, Rolls and Butter. Served with: Salad with Dressing, Garlic Bread. Served with: Fresh Garden Salad with Dressing, Choice of Mashed Potatoes and Gravy or Scalloped Potatoes with Butter and Sour Cream (Choose One), Whole Kernel Corn, Rolls and Butter. Carved from the bone - Served with: Southern Style Macaroni and Cheese or Cornbread Dressing, Green Bean Casserole, Rolls and Butter. Cracklin on the Outside and Juicy Pork chop on the inside. Served with: Sweet Potato Casserole or Smothered Yukon Potatoes, Green Beans, Rolls and Butter. Choice of fries, mashed or scalloped potatoes (Choose One), Homemade Slaw, Rolls and Butter. If your wedding is on a very limited budget, we have this special offer. We feel your day should be as special as you are. This Special Pricing is quoted for no less than 75 guests. All pricing includes disposable serving trays and serving utensils, high-grade plastic plates, clear plastic forks and cocktail napkins. Hot items may require a disposable chafer with sterno; add $30.00 per chafer. For an additional fee Catering Connection Catering will deliver and set up your buffet. Pricing for this service will depend on event location. Catfish Strips - 2 Per Guest. With Honey Mustard, Ranch or BBQ Sauce.